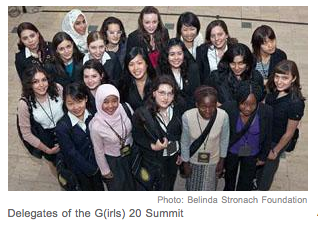 Last week I had the great honor of attending the Girls 20 Summit in Toronto, the brainchild of Belinda Stronach, a former MP who is now the executive vice-chairman of Magna International Inc. Her foundation The Belinda Stronach Foundation, organized the event in collaboration with Oxfam, Save the Children and the Tony Blair Faith Foundation, among others.This forum gives young women from around the world the opportunity to meet and discuss the greatest issues facing girls and women, to have a say in global policy and to represent a voice for 3.3 billion women worldwide, as a prelude to the G20 summit taking place this week. I sat in the audience at University of Toronto’s Rotman School of Business listening to bright, articulate female panelists representing global women’s foundations that are doing incredibly important work. They included Pamela Shifman of the NOVO Foundation, the Nike Foundation’s Swan Palik, Sarah Degnan Kambou, president of the Washington-based International Centre for Research on Women, Jill Sheffield of Women Deliver and Zainab Salbi of Women for Women International. Each amazing…each inspiring! “What is the greatest challenge facing girls and women today? The women spoke passionately, and at times through tears. Their answers intersected along the same theme: lack. Girls and women of the world lack ––respect, safety, personal rights, education, health, freedom of speech, opportunities to be employed and to be paid fairly when they do work. As I listened to the horrific statistics from the developing nations about child brides, gang rapes, the number of young girls who are pulled out of school to care for other siblings or to get married to an older man in an arranged marriage, I felt my arms wash over in goose bumps and tears well up in my eyes. I have three little girls of my own whom I am raising to be strong, confident, intelligent young women. I am raising them to believe that they can be and do anything in the world they set their minds to…now and as they grow up. While I am proud of the opportunity, education, experience and self-respect they have…as a mother, I feel compassion for all the world’s daughters. I feel compelled to do MORE. All the way home in the car my mind raced with ideas, germinating from seeds that had been planted long ago. Some seeds that had been growing from conversations I have shared at bedtime with my daughters as we discussed the reality that many other girls their age face-that they are not allowed to attend school, they are not safe, they are forced to marry and have children at an early age. My children’s wide-eyed expressions when I speak to them, mirror what I imagine to have been my own wide-eyed expression as I listened to the girls I have distantly referenced in my own conversations…standing before me, in person. Their clothes and voices are representative of their different cultures…but we share one heart. I consider the distance they have traveled to be here, to share and learn…to become empowered and to use their voices to change the world. As panelist Sarah Dregnan suggested, I think of all the girls who cannot be here and I think of what I can do to help them be all that they can be…all the things I wish for my own daughters. I am humbled by the entire experience. I am grateful to everyone here, to my friend Sabeen for making it possible for me to attend and especially to Belinda Stronach for creating this meaningful forum. I was able to say a big thank you to Belinda Stronach who was gracious and warm and welcome to future collaborative efforts. My campaign “I Believe She’s Amazing” is a start…a way to express gratitude for the amazing girls and women we share our lives with…and to raise the level of appreciation, admiration and love for the beauty and hope that every girl and woman represents in the world. Once we have reached our 1,000,000-person goal, the next step, is to create a foundation that sponsors girls and women’s initiatives around the world, because we believe they are amazing! This is the juicy stuff I teach in my transformation workshops…and I am in love with living it…to do the things that make us come alive. Well this event has made me come MORE alive. Don’t ever forget one person can make a difference in this world…that one person is YOU! You are eloquent, graceful, and full of life. Thank you for sharing with us your words of peace, power, and possibilities. You are inspiration to all and we are a better place because of your contributions and the life you breathe into it. Keep dreaming. Keep believing. Keep being inspired and inspiring others. Oh my goodness-thank you so much Joann for your beautiful comments! I am so happy to know YOU and to be inspired by you and the way you live your life. Thank you for believing in my dreams and for being an important part of them. This truly is a team effort that cold not be realized without people like YOU. Life is good…I am grateful for beautiful connections…like ours!